Most visitors to Oporto do not come with the intention of shopping for big ticket items, although if you are dying to buy international designer wares, these are available in some of the larger shopping centres. 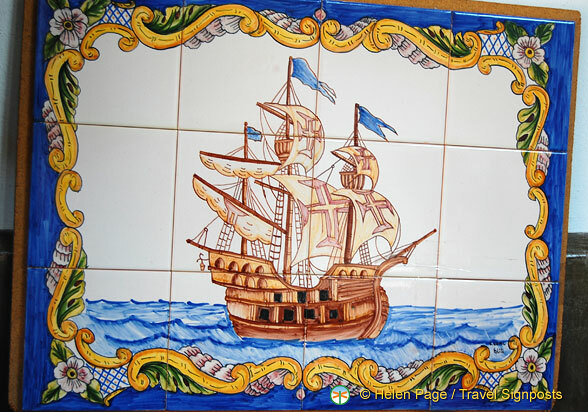 Like many other Portuguese cities, Oporto is a good place to look for traditional handicraft work like embroidered linen, fine lace, hand-painted ceramic tiles, pottery and gold and silver filigree jewelery. There are of course lots of souvenirs that you can buy just about anywhere,including the Mercado do Bolhão. If you’re in the market for books, then Lello Bookshop is the place to go to. But even if you’re not looking for books, this bookshop is an amazing sightseeing attraction. Pedro, our tour director, causes huge excitement when he announces to the ladies that shoes are a good buy in Porto and that you can get them for as little as €5.00. I didn’t see anyone coming back from their expeditions with any shoes, not even amongst the most desperate of shoppers! In fact some had disappointed looks. Pedro later sheepishly clarifies that he didn’t say that it was €5.00 a pair. Santa Catarina is a popular pedestrianized shopping street and here you’ll find many modern shops and cafes, including the Cafe Majestic. There’s also a shopping mall at Rua de Santa Catarina, 312 called ViaCatarina. The Portuguese are a sports crazy people so you’ll see lots of sports shops about. We’re at the waterfront area and O Cantaro Souvenirs is a small shop that’s jam-packed with souvenirs. The purpose of coming to this shop is also to see the craftsman making gold filigree jewelery. 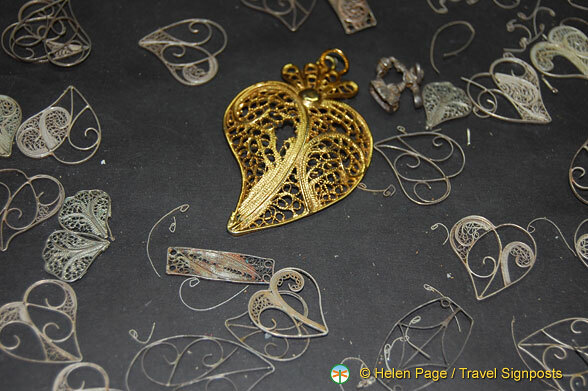 The north of Portugal, in particular Minho, is famous for filigree works, from traditional necklaces, heart shaped pendants, earrings and rings to religious votives and trinklets. The price of gold is of course very expensive and so the gold filigree gets passed in. If you’re looking for more quality handicrafts, the Centro Regional de Artes Tradicionais or Regional Centre for Traditional Arts, more commonly referred to as CRAT, is both a shop and gallery. CRAT is located at Rua Riboleira 37. Port wine is also worth buying in Porto and as we’re heading for port tasting at Sandeman, we are reserving our purchases for then. Note: When shopping in Portugal, it is not customary to bargain, even for handicrafts.